There are three interesting bridges that carry traffic on and off Maishima Island in Osaka Bay. We previously studied the Konohana, a self-anchored suspension bridge. There is also the Yumemai, a floating arch bridge that can be moved out of the way to allow ships to pass between Yumeshima and Maishima Islands in an emergency. 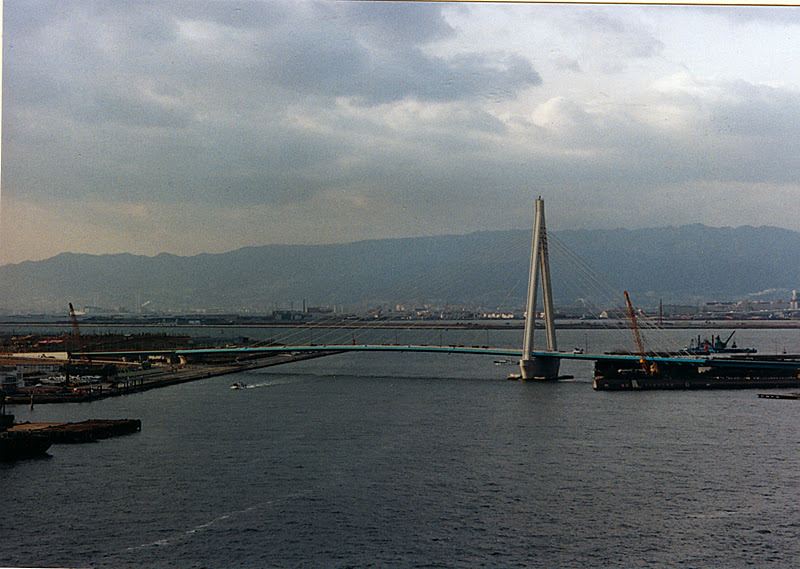 Today's bridge was being built when I visited the Konohana Bridge in 1999. The Tsuneyoshi Bridge is a two span continuous steel box girder cable-stayed bridge completed in 1999. It links Konohana ward with Maishima Island. The bridge is 340 m long, with a main span of 250 m and a side span of 90 m. It has a single steel, two-legged tower supported on a short reinforced concrete pier wall. The tower legs are sloped to come together on top. The bridge is extremely unbalanced and so the short span must be securely tied down at the abutment. The bridge has that turquoise girder and white tower design that we've seen on several bridges in Osaka Bay. Maishima Sports Island and its bridges were built as a possible site for the 2008 Olympics that eventually went to Beijing. Osaka Bay Bridges: Tsuneyoshi Bridge by Mark Yashinsky is licensed under a Creative Commons Attribution-NonCommercial-ShareAlike 3.0 United States License.